It's all very simple. God is love. He is love's origin, example, and architect. 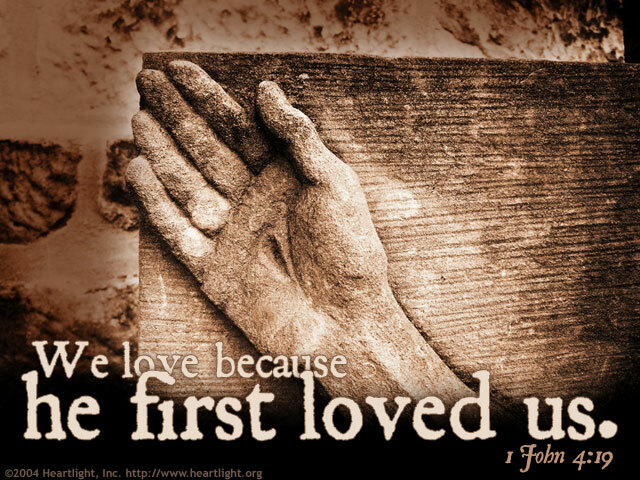 I love because he loved me first. I know how to love because he has demonstrated it. I can love because he made me in his likeness and to share his character. He is the fountain, the motivation, and the pinnacle of love. I love because he does, first, last, and always. God of comfort, thank you for comforting me with your love. Just as a child learns from parents how to do so many things, I want to learn to love as you do: sacrificially, selflessly, and submissively so that others may know that they do not have to earn your love, only receive it. In Jesus name I pray. Amen. The Thoughts and Prayers for Today's Verse are written by Phil Ware. Have questions? Share in spiritual discussion and prayer with someone who cares. Chat now!